According to the Migraine Research Foundation, there are three primary categories of non-drug treatments for migraine patients. 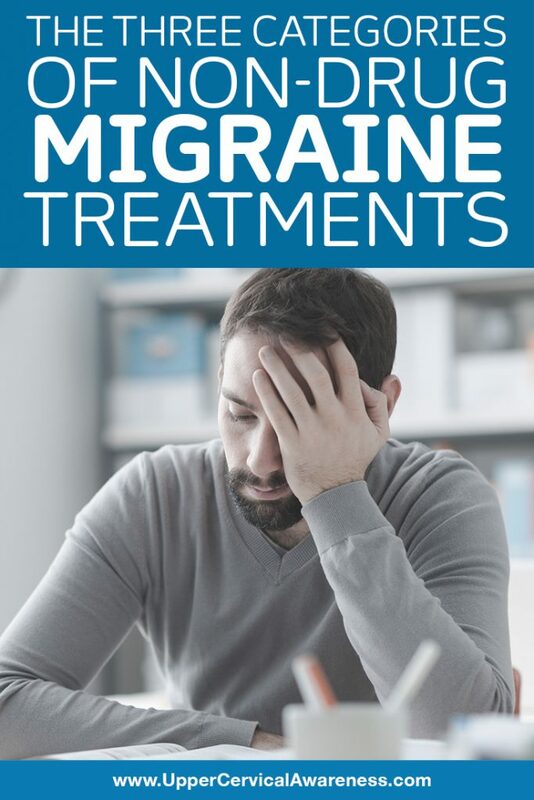 We’re going to discuss these three different types of care, and then we will take a closer look at a therapy that has provided significant improvements for migraine patients in a number of case studies. The first thing we are going to address is a form of self-care. Changing habits can be one way to curb migraines. Here are a few things to keep in mind if you want to give this approach a try. Keep a migraine journal – This can allow you to identify your own personal triggers. Since they can vary from patient to patient, you need to discern what brings on migraines for you. Some triggers, like changes in weather, are unavoidable. However, if you identify triggers you can avoid, then definitely do so. Eat on a regular schedule – One of the more common migraine triggers is missing meals. By sticking to regular meal times, you may be able to reduce the frequency of your migraines. Have a good sleep schedule – You will probably also have more migraines if you don’t get sufficient sleep, so be sure to have a regular time to go to bed and wake up each day (yes, even on the weekend). Sudden changes to your sleep pattern or failure to get enough sleep can increase the frequency and severity of migraines. Maintain a healthy body weight – There is some evidence that suggests the frequency of migraines increases along with BMI (body mass index). One great way to keep weight down is to have a good exercise program. As we will see, that adds additional benefits for migraine patients. Those are just a few of the lifestyle changes that may help a migraineur. Others include everything from dietary changes to only having caffeine and alcohol in moderation (if at all) to giving up smoking (yes, it’s bad for migraines too). Exercise can help migraines in a number of ways. First of all, we’ve already addressed the correlation between migraines and weight gain, so exercise can help fight that problem. Additionally, exercise is good for the body’s ability to regulate pain levels, deal with stress hormones, and produce feel-good hormones. But what about exertion issues? It’s true that migraine headaches often get worse with exertion, so we’re not talking about exercising during a migraine. Concentrate on being regular when you are between migraines and focus on low-impact exercises including various types of stretching. Be careful about straining your neck when exercising, as this area has been linked to migraine occurrence and you don’t want to make things worse inadvertently. Graded exercise is also a good idea, especially if you haven’t exercised in a long time. This will allow you to start off easy and work your way up to a more moderate exercise program rather than jumping right in and paying the price. There are a number of non-drug therapies that help with overall health and well-being. This is called a holistic approach. Today, we’re going to focus on upper cervical chiropractic, a subspecialty of chiropractic that has found success in case studies. However, there are other non-drug therapies that can have a measure of success with migraines. These include things such as physical therapy, massage, acupuncture, and various stress management techniques. Focused Care – Upper cervical practitioners don’t adjust the entire spine, just the top two bones in the neck. Since this is the source of many migraines, it’s a targeted way to get relief. Gentle Relief – There is none of the popping and twisting you may be familiar with from chiropractic care. Adjustments are low-force. Depending on the specific method the practitioner uses, these may be gentle manual adjustments or they may be performed with an adjusting instrument. As-needed Adjustments – Upper cervical practitioners won’t provide an adjustment after every examination. The atlas (C1) has a tendency to hold gentle adjustments for a long time, so there is often no need for weekly manipulation. This also makes upper cervical a cost-effective approach. Cerebrospinal fluid flow – A misalignment can inhibit the proper drainage of CSF. This, in turn, can lead to pooling and intracranial pressure. This has been detected in studies using a test called an upright MRI. Blood flow – The cervical spine facilitates blood flow to the brain by means of the vertebral foramen (tiny loops of bone that are only on the cervical vertebrae and that provide safe passage for the arteries that take blood to the head). A cervical misalignment can affect this proper flow of blood and oxygen to the brain. Brainstem function – The atlas surrounds and protects the brainstem. However, a misalignment can lead to the atlas putting pressure on the brainstem and inhibiting proper function. Intracranial pressure, lack of blood flow, and diminished brainstem function have been linked to numerous neurological conditions, including migraines. So it just makes sense to check the atlas for a misalignment if you get migraines, especially if you have a history of head or neck trauma. Find an upper cervical chiropractor near you today to get your journey to better health started.